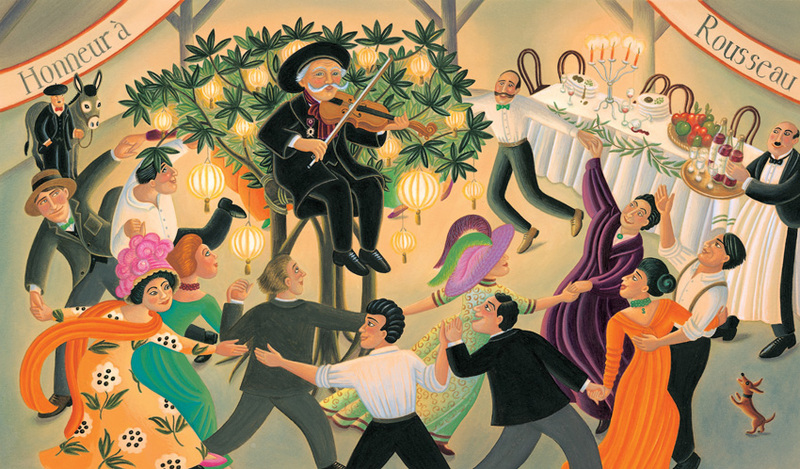 Henri Rousseau was a toll collector for the city of Paris when, at the age of 40, he decided to become an artist--a famous artist. 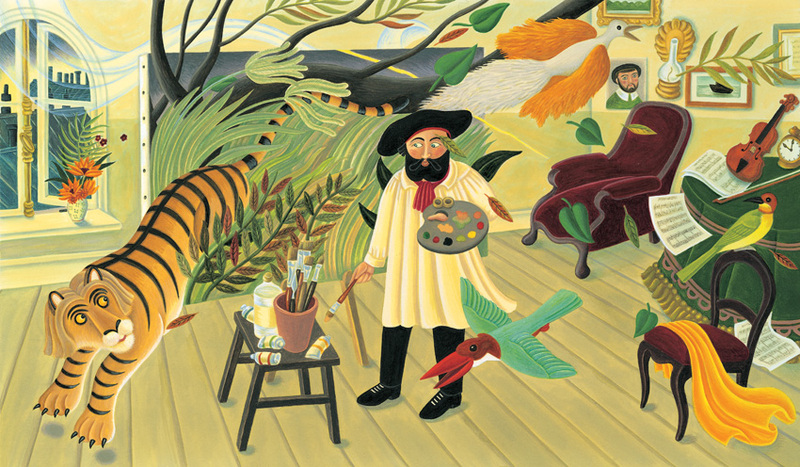 Michelle Markel's picture book biography The Fantastic Jungles of Henri Rousseau (illustrated by Amanda Hall; Eerdmans, 2012) begins with that surprising decision. Her precise and poignant text balances Rousseau's love of nature and growing confidence in his own work (he was self-taught) with his lifelong desire for critical recognition. Poor Henri! 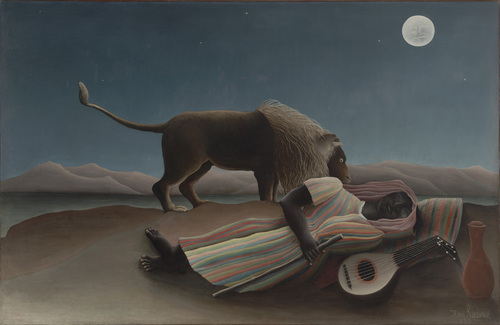 No sooner does he paint something we might consider a masterpiece(The Sleeping Gypsy, The Hungry Lion Throws Itself on the Antelope, and The Dream are referenced in the text or in Hall's illustrations) than the experts say mean things about it: "They say it looks like he closed his eyes and painted with his feet." But Rousseau keeps painting. Eventually, near the end of his life, younger, more well-known artists befriend him. One of them, Pablo Picasso, even throws a banquet in his honor (that's Picasso with Fernande Olivier on the right; a key at the back of the book identifies the other historical figures in the illustration below). The understated text reads, "Sometimes Henri is so startled by what he paints that he has to open the window to let in some air." Aside: Kids might be interested to know that the jungle in the computer-animated movie Madagascar was inspired by Rousseau's work. My own kids were also interested to know that I had a cheap print of Sleeping Gypsy in my college dorm room. It's still my favorite Rousseau.